Welcome to our Jackpot hotel, Four Jacks Hotel and Casino located in Jackpot, Nevada. 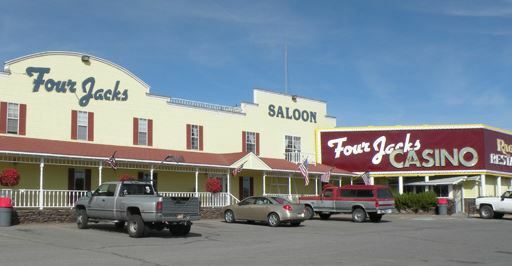 Today is your lucky day because you've found the right hotel to keep you comfortable for your stay in Jackpot, NV. Four Jacks Hotel and Casino will make sure your vacation is convenient and affordable. Our on-site casino invites you to sit back, relax and enjoy the slots. Our affordable rooms allow you to save money so you have more for all the fun things you can do right here in our Jackpot hotel. For more on our onsite attractions check out our attractions page. If you're in town for the great gambling, the fantastic fishing or even on business, Four Jacks Hotel and Casino will treat you right. About Jackpot, Nevada: Settled in the 1950's just one mile from the Idaho border, Jackpot, Nevada is considered a true gambling town. Today, Jackpot is home to numerous casinos that bring in visitors from all over. The community is continually growing and invites everyone to come and partake of the unique and relaxing atmosphere of Jackpot.